BBC NEWS | UK | Politics | Anyone for a game of chess? 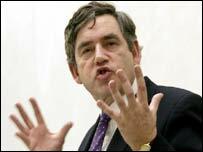 Gordon Brown isn't English, he doesn't do self-deprecating. So when he elaborately apologised to the Commons for saying Britain had been enjoying its longest period of growth for over a century, most MPs knew what was coming. After a Treasury investigation, he'd discovered it was actually the longest period of sustained growth for... 200 years. The Labour laughter wasn't only sycophantic. Strong economic growth is the essential background to what was probably the last Budget that can change voters' basic perceptions of the Brown years before the next general election. The economy has been, by any standards, doing well - by international comparisons, by historical ones. Labour's handful of lean years after 1997 have been followed by the fat years of higher spending. Now, for the Opposition, though, the chancellor has become complacent. Spending is easy to raise, and notoriously hard to cut back on. As Michael Howard put it, if things are so good, how come we're borrowing so much? Why has growth at the top end of most forecasts failed to produce tax revenues as strong? Taxpayers will be struggling with a more personal version of what is essentially the same question: are further tax rises inevitable after the election? No, says Brown. That is hardly a surprise. But perhaps his explanation is - to make the numbers work he promises deep efficiency savings, including a cut of more than 40,000 civil service jobs. Every chancellor lectures private business about the need for tough decisions; no chancellor has ever actually promised to ape the job-cutting bosses himself, certainly not in a Budget speech. A very tough spending round beckons this summer, with cabinet ministers locked into confrontation with their own civil servants. Is the chancellor being too optimistic in believing that his finances will improve, and borrowing fall without extra tax rises? The question is, can Labour actually do this? Tens of thousands of private sector managers will be watching with great and professional interest. But for Mr Brown there is little choice but to try. If the polls are any guide, people's readiness to accept tax rises is wearing thin, and suspicion about how efficiently their money is being spent by the government is on the rise. "Efficiency" is, for once, going to have to be more than a slogan. In his eighth Budget the chancellor wasn't able to move dramatically in any direction - he could not cut back deeply after the huge increase in NHS spending on which he banks so much, nor can he raise taxes or borrowing further. Instead he has chosen to sharpen the political divide symbolically - he announces that the choice of tax cuts or spending remains, and that he chooses spending, this time on schooling and pensioners. What, he asks, will the Tories do? As an act of political economics, this Budget will be highly controversial. As a game of political chess, it was very clever indeed.